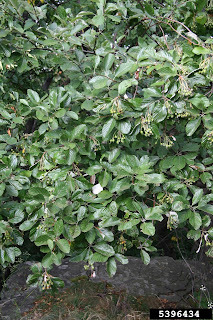 Chickasaw Plum - Prunus angustifolia, is a thicket-forming small tree that has an early blooming habit and folding leaves. It is deciduous and reaches heights of only 20 feet tall. It grows in an erect fashion with multiple trunks and a thicket forming habit. It is native to the United States from New Jersey to Pennsylvannia in the North to Florida, Nebraska, Colorado and New Mexico in the South and West. Commonly found on roadsides, in old fields, sandy clearings, rural homesteads, thickets, in open woods, dunes pastures from 0-600 m.
The bark is a dark reddish brown to gray, splitting but not exfoliating. The leaves are alternate, simple, lanceolate, narrowly elliptic or oblong, upward folding from the mid rib, with a wedge shaped base. The upper leaf surface is lustrous, bright green, hairless with a dull under surface. The flowers are 7-10 mm in diameter, 5 petals, 10-20 stamens each, with white filaments. The fruit is ovoid or ellipsoid red or yellow drupe, 1.5-2.5 cm in diameter. The fruit is considered to be pleasant tasting and can be used for making wine, jam and jellies. The thickets are used by cattle for shading and protection from the summers heat. When thickets form a majority of a cattles grazing area they tend to gain weight faster. The thorned thickets are a popular plantings for songbirds and game bird nesting and roosting. The fruit is eaten by numerous birds and small animals. Lesser prairie-chickens use the cover of the thickets for cooling during the day. Fire can damage the thickets but does not generally kill the plantings. The English Walnut-Juglans regia, is most easily recognized by the combination of large rounded or ellipsoid fruit (nuts) and pinnately compound leaves with 5-9 leaflets each. The leaves are similar to those of the Black Walnut - Juglans nigra and Butternut - Juglans cinerea, the three can be easily confused for one another by the untrained eye. The English Walnut is a fast growing deciduous tree that reaches heights of 80-85 feet tall. It grows in a single trunk erect/upright fashion with a slender trunk and crown made up of spreading and ascending branches. The bark of the English Walnut is smooth and brownish in color, becoming an irregularly furrowed silver gray with age. The leaves are alternate, pinnately compound and made up of 5-9 leaflets that are opposite one another. The leaf base is broadly wedge shaped, the tips pointed and margins running the entire length of each leaf. The male flowers occur in Spring in the form of spikes that are 5-15 cm long each with 6-40 stamens each. The fruit is a large rounded or ellipsoid nut or drupe that averages in size from 4-6 cm in diameter with a green husk that matures in Summer or early Fall. Originally introduced from Asia and cultivated in cooler portions of the East, not believed to be naturalized in the United States at this time. Walnuts are harvested and sold in two forms shelled or in their shells (whole). The number one producer of Walnuts is China, Iran and the United States follow behind (though not closely as they each only produce about a quarter of the Walnuts that China does annually). Walnuts must be handled and stored correctly so as to not mold, mold on a Walnut produces aflatoxin, a potent carcinogen. A mold infested walnut batch should be immediately discarded and can not be salvaged. Walnut hulls contain phenolics, this chemical can stain hands and cause skin irritation or potential allergic reactions on sensitive skin. The Golden Dewdrops - Duranta erecta, are most easily identified by their brilliant sky blue colored flowers and bright yellow fruit. They originated in the West Indies but have been naturalized from South Florida to East/Central Texas. In the United States they are found primarily on disturbed sites, pine lands, and hammocks from 0-100 m. An evergreen shrub, occasional vine or rarely a small tree they reach heights of only 20 feet. The unique sky blue flowers are about 1cm in diameter, with 5 petals each, borne in an elongated raceme ranging in size from 5-15 cm long. The flowers occur year round. The fruit is a round yellow drupe that matures year round an averages about 1.5 cm in diameter. The leaves are opposite, simple, elliptic or egg shaped, tapered to a short point at the tip. The bark is simple and gray when young, becoming fissured and rough with age. The Golden Dewdrops is a member of the Vervain (Verbenaceae) family that includes roughly 35 genera and 1000 unique species found in only topical and sub tropical regions. This family includes many colorful ornamentals and recent research shows this family is closely related to the Lamiaceae (mints & teak are in this family). The "Sweetbay Magnolia" - Magnolia virginiana - is native to the Eastern/Atlantic and Gulf Coast regions of the United States, with it's highest "natural" numbers occuring in the South Eastern States of Alabama, Florida, Georgia and South Carolina. It grows naturally most commonly in poorly drained or highly acidic soils that are often subject to flooding. 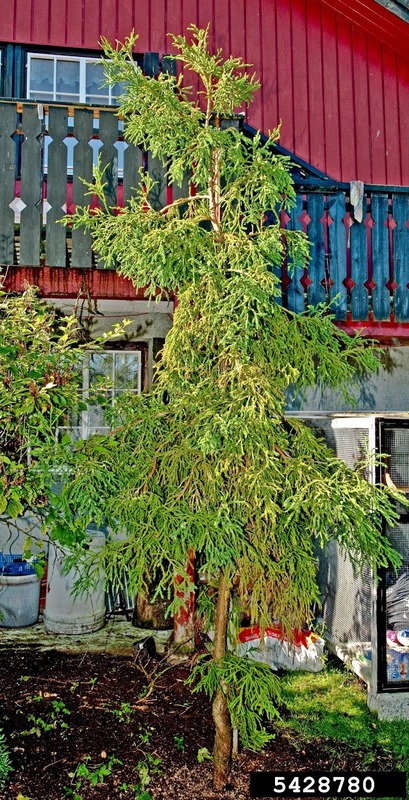 This tree has a vase shaped growth habit and generally reaches 10-20 feet tal at maturity. It is considered a medium to fast grower, gaining an average of 12-24 inches per year when young. Though it is not as showy as it's counterparts (the more commonly planted ornamental Magnolia's) it offers great interest from May - Late June when it is in bloom. After the initial bloom, some flowers will often continue to sporadically appear late into the summer season, disappearing before the first frost. The blooms are a creamy white in color, highly fragrant and 2-3 inches in diameter. The scent of the flowers is often compared to a light lemon or citrus scent. When the flowers disappear the "fruit" appears in the form of red-orange cones often growing in clusters. This fruit is eaten by a wide variety of animals including Squirrels, Mice, Turkey, Quail and many Songbirds. The leaves are simple oval shape with a slight point at each end (lanceolate). They are a glossy dark green in color with a lighter silvery underside. In some areas of the United States, the leaves are retained throughout the year, because of this it is considered to be semi-evergreen. The Sweetbay Magnolia is hardy in USDA zones 5-9. Some cultavars found at local nurseries may include the Southern (australis), Henry Hicks, and Moonglow. The Rubber Tree - Hevea brasiliensis, is also called Sharinga Tree, Rubberwood or Para Rubber Tree. It was only originally found growing in the Amazon Rainforest but was planted in more widespread tropical and sub-tropical areas once the demand for it's naturally produced rubber increased. This tree is a member of the Euphorbiaceae family and has major economic value because of it's milky latex that naturally occurs within the tree. Recorded uses of this and similar tree rubber/latex products date back to the Olmec people of Mesoamerica some 3600 years ago. By the late 1800's rubber plantations were established in the British colonies, Java, and Malaya. Today most rubber plantations outside of the native region occur in tropical portions of South/East Asia and West Africa. Cultivating in South America has not been satisfactory because of leaf blight this leaf blight is a major concern for plantations worldwide as it has not been cured or corrected and is thought to pose a threat to all varieties/clones growing today. 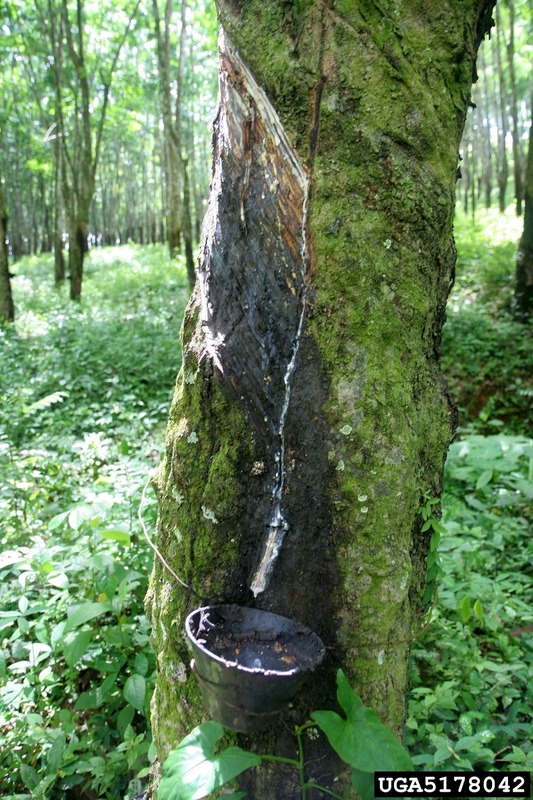 This latex that occurs in the Rubber Tree is the primary source of natural rubber, it occurs in vessels within the bark just outside of the phloem. The vessels spirals up and around the tree in a right handed helix pattern forming an angle of about 30 degrees and occurring at heights of up to 45 feet. In the wild the tree has been found to reach heights upwards of 100 feet, but this is not very common. Trees grow at a much slower rate once they are tapped for latex and are generally cut down after about thirty years as they usually stop producing at this point so they no longer have economical value. When harvesting cuts are made in the vessels but only deep enough to tap into them without harming the trees growth. In order to grow these trees require tropical or sub-tropical climates, with no chance of frost. One simple frost event can completely wipe out a plantation and be detrimental to production as the rubber becomes brittle and breaks. Latex production is not very reliable the amount and quality is variable from tree to tree. When a tree is tapped (the process is called rubber tapping) the latex is collected in small buckets and looks almost similar to the process used to collect syrup from Maple trees. The Gray Birch - Betula populifolia Marshall, is most eaily distinguished by it's triangular leaf with flattened base, elongated tip and doubly toothed margins. It is a deciduous tree that reached heights of about 40 feet. Generally growing in a multi trunk, curving or leaning fashion it makes for a beautiful focal point in both residential and commercial landscape settings. The bark of the Gray Birch is red-brown when young, becoming a gray or chalky white when mature. The bark is smooth and tight, not usually exfoliating like some other Birch (Betula) varieties. The leaves are alternate, simply shaped, thin and pendulous. The triangular leaves are often compared in size and shape to those of the Quaking Aspen. Leaf color ranges from a lustrous green in the Spring to a yellow or yellow-orange in the Fall. The flower appears in late Spring in the form of a cylindrical catkin. The fruit is a winged samara with wings broader then the body, they are borne in a narrow, bluntly pointed, erect or drooping structure. The Gray Birch is native to the North East and Mid Eastern portions of the United States and extreme South Eastern portions of Canada. It can be found from North Carolina and Virginia in the South, Illinois and Indiana in the West, New Brunswick, Quebec and Ontario in the North. It prefers moist, well drained, rocky or sandy forests, abandoned sites (fields, pastures) and can often be found on natural reforestation sites that have been burned, or cleared. Hybrids of the Gray Birch and Mountain Paper Birch are often called Blue Birch . The White Ash - Fraxinus americana, is best identified by it's opposite compound leaves with 5-9 leaflets that are whitish on the undersides. It is a large deciduous tree that reaches heights of 40 - 90 feet tall, it grows in a erect fashion with a single trunk. It is native to upland woods, floodplains, dry hills, hammocks, and cove forests. It's range is widespread along the East coast, from Ontario, New Brunswick and Quebec in the North, West through Eastern Nebraska and Eastern Texas. The bark is scaly, grayish, narrowly ridged and furrowed with furrows forming diamond patterns towards the base. The leaves are opposite, pinnately compound, 5-9 ovate leaflets with bluntly toothed margins. The upper leaf surfaces are dark green while the lowers are whitish, hairy when immature. Fall leaf color ranges from red to maroon to yellow. The fruit is a narrowly elliptic or linear samara that ranges from 2.5-3.2 cm long that matures in late summer to early fall each year. There are three other variations of White Ash that were originally grouped together as one species. They are now identified as individual species the Texas Ash - Fraxinus albicans Buckley, Biltmore Ash - Fraxinus biltmoreana Beadle, and Fraxinus smallii. The ranges of these smaller species are much smaller and overlap the native range of the White Ash but not one another. The Bur Oak - Quercus marocarpa, is best identified by the combination of fiddle shaped leaves, winged twigs and large acorns with fringed cups. It is a deciduous tree that reaches heights of 80-160 feet tall on average. It grows in an upright, erect form with a single trunk and spreading crown. It is native to poorly drained woodlands, bottom lands, sandy plains, prairies, dry uplands and around clay or limestone between 0-1000 m. It can be found as far North as Manitoba, Ontario and New Brunswick on South through Tennessee, Oklahoma, Virginia and even portions of East/Central Texas and other portions of the Gulf Coast. The Bur Oak has the largest acorn of any Oak species North of Mexico and is also the most Northern ranging and cold tolerant of all Native American Oaks. It's range extends well into Canada but as the range continues North the size of the tree decreases, becomes shrubbier, less upright and the acorn size also decreases. The Bark is a dark gray in color, flattened with scaly ridges and deep vertical furrows. The leaves are alternate, simple, elliptic to obvate often fiddle shaped. The upper leaf surface is lustrous, dark green to greenish gray. The lower leaf surface is pale green with a thin covering of tiny branched hairs. The fruit is in the form of an ellipsoid acorn with a cup ranging from 1.5-5 cm deep that ancloses half of the light brown nut on a stout 6-20 mm long stalk. The Bur Oak is similar to the White Oak and often confused to the untrained eye. It's recommended hardiness range is 3-8. Bur Oak is a shade tree, boasting a spreading canopy capable of blocking sunlight. It is often planted as a shade tree and prefers full sun (at least 6 hours direct sunlight per day). The acorns of the Bur Oak are the preferred food for wood ducks, wild turkeys, white-tailed deer, rabbits, mice, squirrels and other rodents. The Eastern Redbud - Cercis canadensis, is most easily recognized by the combination of Magenta flowers, flattened legumes and heart shaped leaves. It is a deciduous tree that ranges in height from 25-45 feet tall. 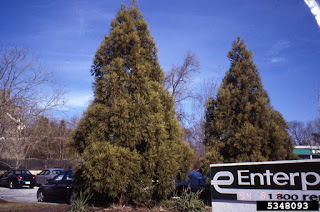 Growing in an erect from with a single trunk, low branches and a rounded crown. It is native throughout the East from Ontario, New York and Massachusetts in the North and Central Florida to Texas in the South. It prefers moist or dry woodlands, sloped area and roadsides. The Eastern Redbud is easy to identify by it's flowers, leaves, legumes and bark. The bark is gray-brown in color and mostly smooth. The leaves are alternate, simple, unifoliolate, heart shaped or abruptly pointed. The leaves are dull in sheen, medium to dark green in color, hairless, and paler in color on the lower surfaces. The flowers are bi-sexual 10-12 mm long, 5 sepals, 5 petals, 10 stamens, light to dark pink or magenta in color appearing in Spring prior to the new leaves. The fruit is a flattened and oblong legume that is 6-10 cm long and appears in late Summer to Autumn. Cercis is a small genus of only 8 species, 2 of which are native to North America and most are often low branching. The Eastern Redbud is most often used as an ornamental and is often planted in combination with the Flowering Dogwood. The Eastern Redbud is recommended for hardiness zones 4-9. This tree is considered both a flowering tree and an ornamental tree and is planted for both reasons. It is typically planted for both its visual interest and beautiful showing of Spring flowers. The Guava, Psidium guajava is best recognized by the combination of stiff opposite leaves with very prominant venation, scaly bark and distinctive fruit. 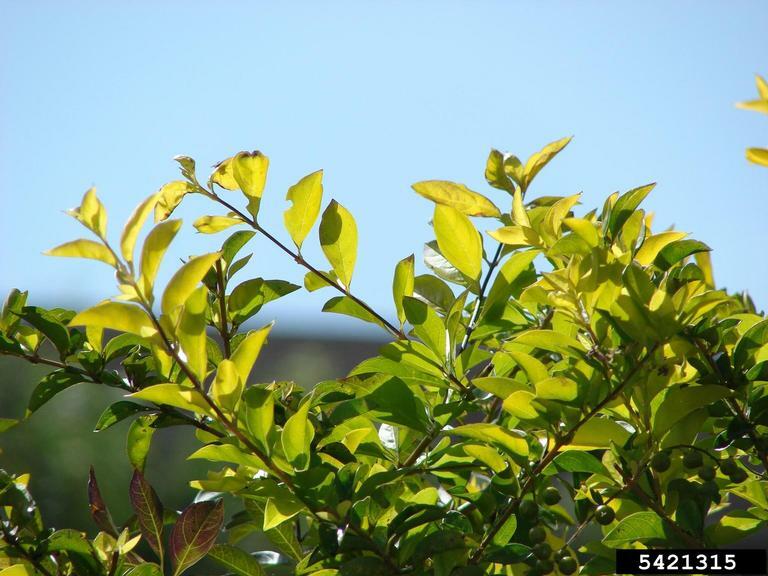 It is an evergreen shrub or small tree that reaches heights of only 15 feet. It grows in an upright fashion with a spreading crown. The bark is smooth and red-green in color with bark that shreds in thin plates. The leaves are opposite and simple in shape, thick, leathery, wedged at the base and with an abruptly shaped point on the tip. The flowers have 5 petals and are white in color. The fruit is green, yellow or pink in the form of a berry that is rounded or pear shaped. The fruit of a Guava is different by species and can range from roughly skinned with a bitter flavor or soft skinned and sweet. In Mexico the guava is made into beverages, sauces, candies, fruit bars, desserts and dried snacks. In many countries the fruit is eaten raw like an Apple of quartered and eaten with salt and pepper or served in salads. In Pakistan the Guava is the national winter fruit. In the Phillipines Guava is used in cooking sinigang. In Asia & Taiwan it is eaten with sweet and sour plum powder mixtures. The Chinese Elm - Ulmus parvifolia - is also referred to as the Lacebark Elm. It is a small to medium deciduous or semi-deciduous tree that reaches heights of 30-60 feet tall on average when mature. 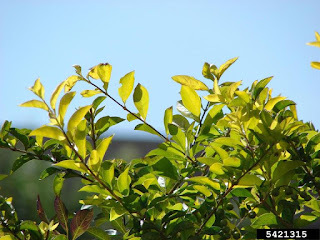 It is considered a tough landscape tree and is tolerant to sites that are not ideal for other plantings such as parking lots, street/patio planters and even windswept coastal areas. The bark is a beautiful combination of greys, reds, and tans that appear in a flaking or lace pattern (hence the name Lacebark Elm). The leaves are small only 2-5 cm long, single toothed and green in color during the growing season. The leaves change to a deep purple-green in the fall. Many Chinese Elms in the United States and Europe retain their leaves into late December or even early January. The Chinese Elm is considered a very tough wood with interlocking grain. This type of Elm wood is used for hardwood floors, tool handles, cabinets, veneers, and furniture making. The lumber takes well to stains and turns well with wood turning machinery but is not easy to carve using hand tools. The heartwood of the Chinese Elm ranges from reddish brown to light flesh color and the sapwood is a very light off-white. The graining of Chinese Elm wood is very beautiful. Freshly cut Chinese Elm is said to have a peppery/spicy odor which is not a trait of any other Elm. Though a native of Asia (China, India, Taiwan, Japan and North Korea) the Chinese Elm is hardy in zones 5-9 and is used commonly in landscaping as a shade or specimen tree. It's strong qualities and beauty have made it so popular that it can be found planted on every continent except Antartica. There are many different cultivars available and with each the cold hardiness range could vary. The Chinese Elm is very resistant (but not 100% immune) to Dutch Elm Disease, a serious disease that has devestated others in the Elm family. There are multiple varieties of Whitebeams that are used in various settings most of which have simply shaped slightly rounded and broad leaves. 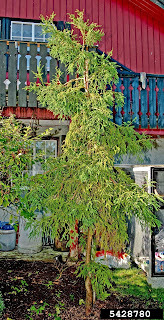 Whitebeams are Old World trees native to the Northern Parts of the Eurasian landmass, from the British Isle to Japan. The Common Whitebeam -Sorbus aria - also called the Chess-Apple is native to southern England and parts of Central Europe.The Lutescens which is used as a street tree because of it's tight egg shaped crown. The Majestica which is mainly found in France and has larger leaves. The Himalayan - Sorbus cuspidata is a vigorous tall growing tree, with thicker and longer leaves with shallow toothing and slight lobing. The Wilfred Fox(a hybrid of the common and the Himalayan) this variety is strictly upright and does not have red fruit as the others do. 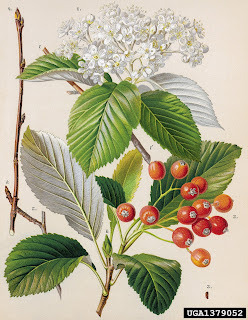 The Finnish Whitebeam -Sorbus thuringiaca (unknown origin) also a hybrid has a very different appearance then all of the other Whitebeams, it's leaves are not simply shaped they are instead deeply lobed or pinnate with 1-2 separate leaflets at the base of each leaf. Whitebeams are moderate sized trees, growing as tall as 60+ feet. They withstand the harsh conditions of street type locations in European city suburbs. The leaves are generally simply shaped, rounded and broad (except on the Finnish, theses are deeply loped) Green above and silver below. 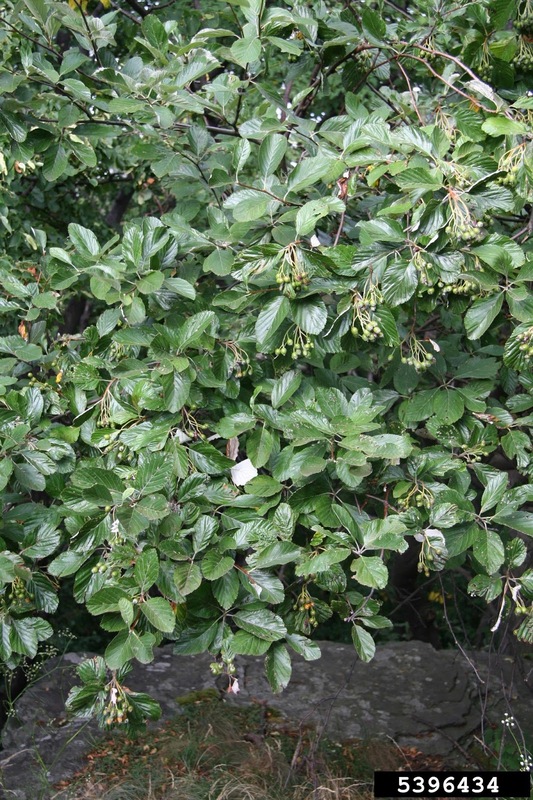 The fruits appears in bunches of small berries, depending on the variety the berries are red, orange or sometimes brown. The flowers are generally small and white in color, bisexual and usually arranged in large, branched corymbs, except on the Himalayan their flowers are larger and have a strong scent similar to the Hawthorn. Flowers on the Whitebeams are smaller in size and number then the Mountain Ash, the berries also occur in lesser numbers. Whitebeams are not commonly found growing in the United States as they are not native to our area. When found they are primarily planted in park settings or as specimen trees but never growing wild. The Stewardia (also spelled Stuartia) is a small genus of only 8-20 species of flowering plants in the Theaceae family. They are closely related to the Camellia. They are mostly native to the Eastern portions of Asia including China, Japan, Korea, Laos, Vietnam Myanmar, and Thailand. There are two species native to Southeast North America, from Virginia and Kentucky to the North and Florida through Louisiana in the South. The Stewardia varieties range in size from shrubs to small trees. As trees they can reach heights of 10-65 feet (Asian Varieties) and 10-30 feet (American Varieties). One of the most recognizable features is by far their beautiful bark. The smooth bark can range in color from orange, yellow, or brown and peels in fine flakes revealing more depth of colors underneath.The Stewardia are mainly deciduous with a few members being considered evergreen, these are sometimes even categorized into an even smaller genus known as Hartia. The leaves are simply shape and arranged alternately. The leaf edges are serrated and the upper surface is usually glossy. The leaves range in size from 3-14 cm long. The second most identifiable feature of the Stewardia is the showy flowers. The flowers are large ranging in size from 3-11cm diameter. Each flower is made up of 5-8 petals. Flowering generally occurs in the mid to late summer depending on the region. The flowers are white in color with orange centers, the flowers coloring greatly compliments the bright green leaves. The genus was named by Carolus Linnaeus in 1753 to honor John Stuart, 3rd Earl of Bute. The name Stuart was transcribed incorrectly and instead spelled Stewart, leading to the spelling Stewardia. Many publications have used both versions of the spelling with the "Stewardia" version being the most universal, the Stuardia spelling was used more frequently in the 19th century. The Stewardia requires full to partial sunlight. It prefers wet soil and is not tolerant to drought. It is a slow grower and makes for a beautiful specimen tree it offers year round interest. The recommended hardiness zones are 5-7( or 5-8 depending on variety).